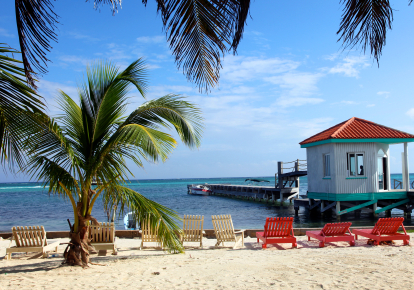 Belize — bordered by Mexico, Guatemala, and the Caribbean Sea — is a permier Caribbean destinations, especially for its beaches and Mayan ruins. Located on the northeastern coast of Central America, it is the only country in the region where English is the official language, although Kriol and Spanish are commonly spoken. The country boasts a remarkable diversity of culture, history and natural resources. University of Vermont students can participate in two Belize programs: Women’s Health and Spirituality: A Cross-Cultural Exploration and Belize Semester Abroad Program in Sustainable Development. Study Abroad Scholarships up to $1,000 may help defray the cost of the program. International Education Fee Scholarships are awarded to undergraduate, graduate and post-graduate students based on a complex mix of criteria including program of study, academic record and financial need. Houston Junior Chamber of Commerce Scholarships are awarded to all levels of students. Students who have not participated in a study abroad program or who are going for longer programs are preferred. Michigan State University’s College of Agriculture and Natural Resources offers Entrepreneurship and Development: Agriculture and Environmental Studies in Belize. Students will study Belize’s managed wildlife areas, fisheries, flora and fauna and sustainable development. Student participants should consider applying for study abroad scholarships ranging from $250 to $1,750, depending on length of study, or the Kellogg Foundation Scholarships that reward outstanding students studying agriculture and natural resources or business. The Organization of American States is based in Washington, D.C., and it offers financial assistance at the undergraduate and graduate levels for students from its 35 member states, including Belize. Scholarships are awarded for up to 12 months, and can be extended. At the undergraduate level, students can enroll in a program of their choice at an institution in one of the OAS member states, as long as is not located in their country of origin or where they are a permanent resident. Monies are available for graduate studies (with the exception of introductory language studies and medical sciences) as well as graduate research. The OAS also provides hundreds of professional development scholarships and programs, including online.